After all the sourdoughs, breads without sugar, I was dying for really really soft sweet Asian Breads. I checked out Happy Home Baking's web and I was pleased with what I saw. Hearty Bun, how nice. This is what I need. My husband and son was away for a week and its timely to give them a heart. I set about preparing the Sweet Dough. I have not tried Alex Goh's Sweet Dough Bread. As his bread usually last longer, remain soft for at least up to 4 days without reheating, I've decided to go with his recipe on the dough instead. Preparation of the gelatinized starter is required ahead of time. I actually left it for about 18 hours in the fridge before I started working on the dough. The rest is easy, mix it well, butter goes in last. I used Richard Bertinet's Sweet Dough Kneading Method to work on the dough. Thanks for Happy Home Baking's reminder, I kneaded the dough for almost 20 minutes in my hot kitchen of 30 degree celsius. My perspiration was dripping all over. It felt like sauna. I wonder how anyone can bake under the condition of more than 30 degree celsius. After the kneading, it felt sticky still. I threw a little flour like what Richard Bertinet does, and pulled the dough into a nice ball. Put into my Pyrex Glass Bowl, cover with a damp cloth, brought out into my living room which is slightly cooler than my kitchen, and left it rise for 1 hour. As it is warm and humid, the dough rose very well and quickly. I almost forgot about it as it was dinner time. Putting my dinner aside, I quickly did one stretch and fold, leave it aside and went about preparing the tuna and blue berry. For the tuna, it was easy to mix up. Mix the ingredients up and set aside. For the blueberry cream, I used the ingredient in Alex Goh's Magic Bread book on the Pork Floss Cream. I didn't have any pork floss and I used blueberry instead. Took awhile to whip up the cream but it was smooth and sweet. I divided the dough to about 50g each. I used the methodology that Happy Home Baking referred to - QQuinn's Baking Diary - lovely post, and shaped the dough into heart shape. As I was shaping, I realised that you got to be pretty exact in your cutting, or else you are going to get a lopsided heart shape. In addition, it'll be easier if you roll the doll long, with a tip at the end, the heart shape will turn out pretty good. As the heart shape appeared, I was pretty happy with what I got, but my perspiration continued to roll down my face. Trying hard to focus, I brushed the dough with egg wash, and put the tuna in the middle, that was a little dented caused by the shaping. I realised I should have meshed the tuna a little more, to make it lighter. 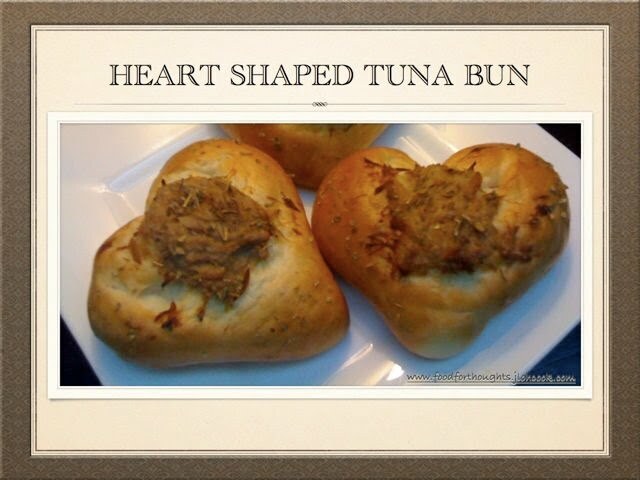 Anyway, After I added the tuna, I decided to decorate my heart shaped buns with oregano. At first I added onto the tuna, then I thought, it'll be pretty nice to have it on the bread as well, so that it won't look so plain. My decision was correct. I love the look of it, and the smell of oregano. My only problem was with the weather. Hot and humid, The dough was rising faster than I can handle. I quickly put the rest of the dough that I was not using into the fridge before they proofed. In the meantime, I heated up the oven. My oven is usually about off 10 degree, therefore, I set the temperature at 190 degree celsius. 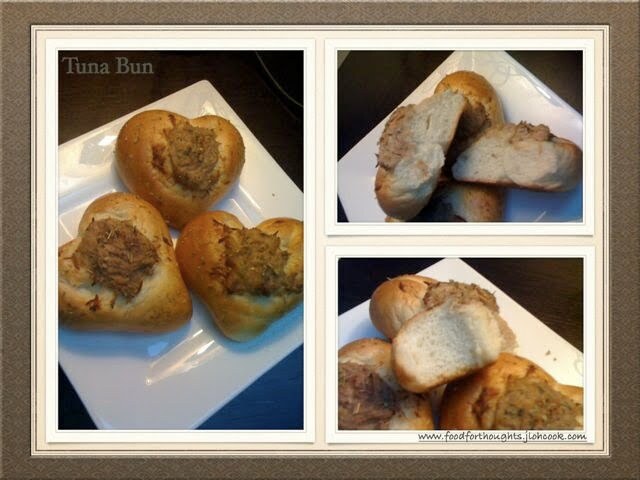 I baked the Heart Shaped Tuna Bun for 18 minutes. The smell was awesome. The bun came out golden brown due to the egg wash and really soft to the feel. I let it aside to cool. While the Tuna Bun was baking, I had my quick dinner before I started on the rest. 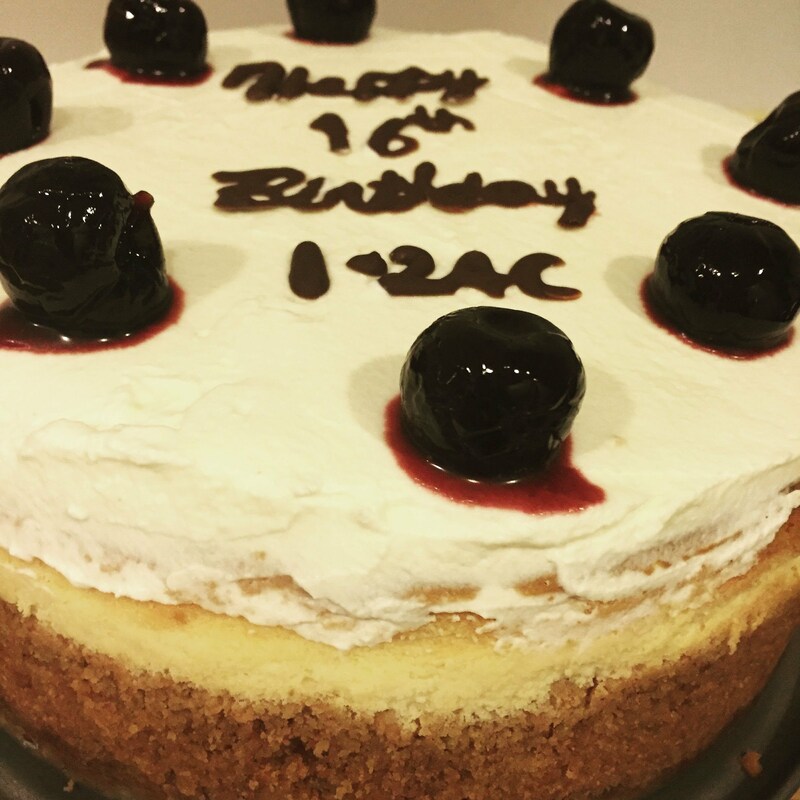 I wasn't sure how I should be shaping it and decided to go for a round shape hoping to fill it with the blueberry cream in the middle. The first one didn't work out as I expected. The seams didn't close and I decided an open face one. The shaping for this is really daunting, as I tried all means and ways for the blueberry cream to stay inside the dough rather than outside. After a few shaping, I finally got one that did stay inside, but the rest, were somehow just popped out. For the last 2 I decided to do a snail and put it on top instead, an open face blueberry bun. Well this works well, except that it was difficult to keep the dough pressed down. The weather was so hot, the dough keep rising. Immediately after I shape and set aside, it didn't take me long to proof the bread. probably 15 - 20 minutes. I just kept going on baking. I had to do this in 3 batches as I want to ensure that the dough do not stick to one another while baking. I do have a small oven. I love the taste of this bun. Although there's sugar and butter, it was not too much. 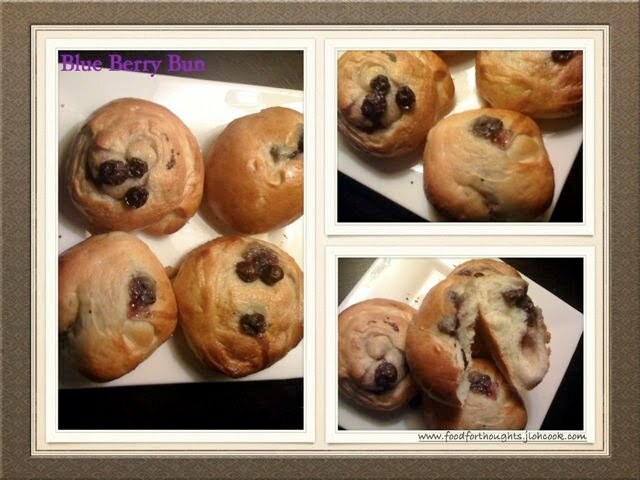 My son loves the tuna ones, I like the blueberry ones, although I wished I could have gotten more blue berry into the bun. The buns were really soft as expected. My mother in law certainly prefer this to my sourdough. Now, it's in an airtight container, I guess I didn't even to worry about it lasting for 4 days. Mixed and leave to cool before putting into the fridge for at least 12 hours.